The same hard shell, circumferential protection as a cast. A black outer shell and black liner of thick foam encased in black brushed nylon for protection and comfort. 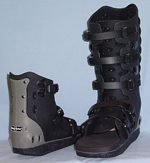 Leaverage fasteners, similar to ski boot buckles, are attached directly to the shell to give a more controlled compression. A beveled rocker sole helps to prevent slipping. Available in high and low styles, small, medium and large sizes. Replacement liners are also available. An ultra low profile walker with a full rocker sole to provide smooth heel-to-toe transition. The padded liner is washable and double vented to promote air circulation. Anatomically contoured stirrups prevent ankle motion without causing friction against the sides of the calf. A full-length insole of pressure-moldable comfort foam conforms to the foot. 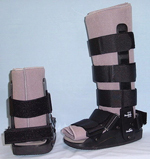 Four separate comfort pads included to aid in immobilizing and padding the brace. Available in five sizes, x-small thru x-large. A lightweight walker for improved comfort and decreased patient fatigue. 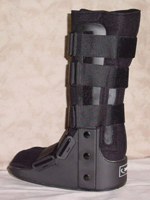 A heel height of only 1 1/2 inches for improved gait pattern and less hip and low back pain. Available in Standard Lower Leg Walker, 5351, used for the treatment of stable foot, ankle and distal lower leg injuries; and Low Top Walker, 5352, used for treatment of conditions of the foot. Sizes are unisex small, medium/large and x-large. Replacement liners are available.